The mission is simple! Serve delicious affordable food with outrageous homemade desserts and awesome wine and cocktails. Learn some of Consiglio's secrets and how to prepare a delicious four course dinner. Menus change monthly, or gather a group of at least 10 and book a private class and you get to choose the menu! Whether it's a special event or a hassle-free meal with family, we'd love to have you! Consiglio's cozy atmosphere, exquisite cuisine and friendly service are the ideal combination for special events! 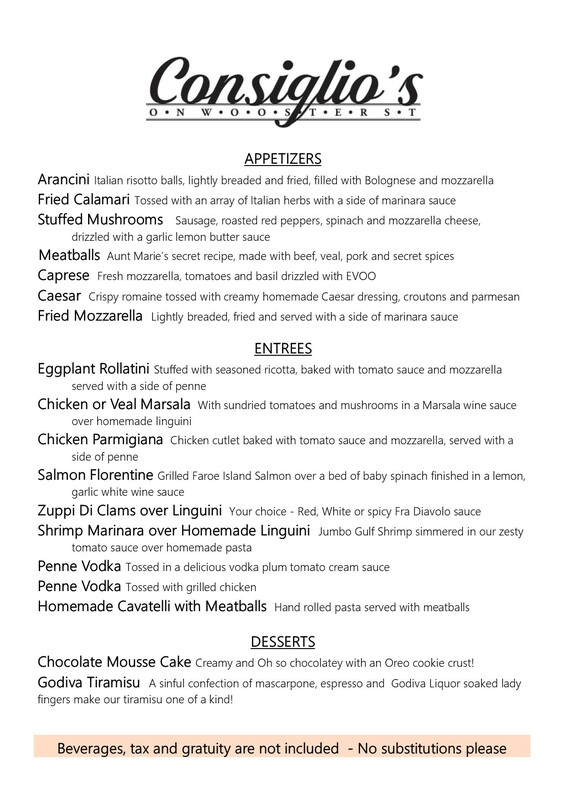 Whether business or personal, make it a day or evening to remember with Consiglio's delicious food! Consiglio's not only offers the best of southern Amalfi cuisine featuring our famous Cavatelli and Braciole, but we also offer cooking classes, events and outdoor patio dining. We also have a brand new food truck ready to serve at your next party! We are delighted to host your special occasion and can hold up to 75 people for a banquet in our dining room. We offer take out catering and full service for those preferring a stress free event. We also have a brand new food truck ready to serve at your next party!